Annual pre-orders for Ferndale turkeys are open now! Every year for Thanksgiving, the St. Peter Food Co-op sells local, pasture-raised turkeys from Ferndale Farms. 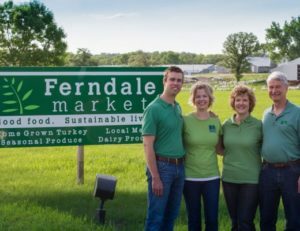 Family owned and operated for three generations, Ferndale Farm was established in 1939. Their turkeys are raised without antibiotics; fed a natural diet from a local feed mill; and processed without additives. Use the form below to pre-order a specific sized turkey. We typically have extra turkeys on hand during the holiday season, so if you forget, just stop by or call the store before Thanksgiving. However, if you’re looking for a particular size, pre-ordering is highly recommended. Turkeys will be $2.79/lb and can be picked up on November 16th or November 20th. 2018 Ferndale turkey pre-orders are now closed.